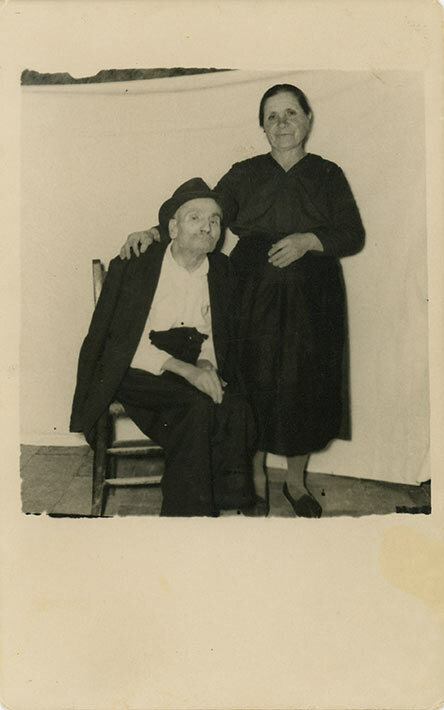 Black and white postcard of photograph of older couple, Aquara Salerno, Italy, 1950s. The married daughter of the couple emigrated to Canada to be reunited with her husband. Many children immigrated leaving behind aging parents. In this case, the elderly man was ill in bed. After his death, his three other children followed their sister to Canada, benefiting from family sponsorship immigration law. In the post-war years, from 1950 to 1970, Canada saw its highest numbers of Italian immigrants yet. Numbering about 500,000, these new Italian Canadians surpassed the number of earlier immigrants. As a result, they began to redefine what it meant to be Italian Canadian.